What it shows is an extremely common situation – an axis, where one type of cost is very large at one end of the scale (red line), and a conflicting type of cost is very large at the other end of the scale (green line). 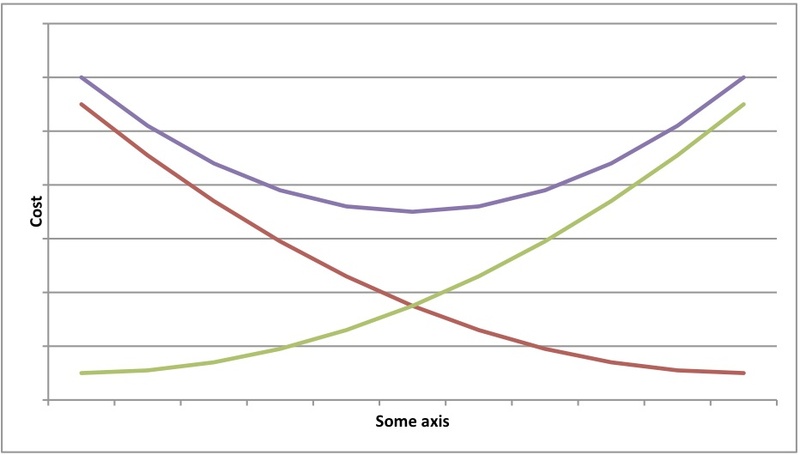 The total cost (purple line) has an optimum somewhere between the extremes. I mentioned one such situation when talking about teams working in isolation or interfering with each other. To me, another example is doing design up-front. If you don’t do any design before starting to write a significant piece of code, you’re likely to go very wrong – if nothing else, in terms of performance or scalability, which are hard to engineer in at a late stage. But on the other hand, Big Design Up Front typically means that you waste a lot of time solving problems that, once you get down to the details, turn out never to have needed solutions. It’s also easier to come up with a good design in the context of a partially coded, conctrete system than for something that is all blue-prints and abstract. So at one end of the scale, you do no design before you write code, and you run a risk of incurring huge costs due to mistakes that could have been avoided by a little planning. And at the other end of the scale, you do a lot of design before coding, and you probably spend way too much time agonizing over perceived problems that you in fact never run into once you start writing the code. And somewhere in the middle is the sweet spot where you want to be – doing lagom design to use a Swedish term. The diagram shows a useful way of thinking about situations for two reasons: first, these situations are very common, so you can use it often, and second, people (myself very much included) often tend to see only one of the pressures. “If we don’t write this design document, it will be harder for new hires to understand how the system works, so we must write it!” True, but how often will we have new hires that need to understand the system, how much easier will a design document make this understanding, and how much time will it take to write the document and keep it up to date? A lot of the time, the focus on one of these pressures comes from a strong feeling of what is “the proper way to do things”, which can lead to flame wars on the web or heated debates within a company or team. An awareness of the fact that costs are not absolute – it is not the end of the world if it takes some time for a new hire to understand the system design, and a document isn’t going to make that cost zero anyway – and of the fact that there is a need to weigh two types of costs against each other can make it easier to make good decisions and have productive debates. For me, a particularly interesting example of conflicting pressures is where work processes are concerned. I think it is fair to say that they are introduced to prevent mistakes of different kinds. With inadequate processes, you run a risk of losing a lot of time or money: lack of reporting leads to lack of management insight into a project, which results in worse decisions, lack of communication means that two people in different parts of the same room write two almost identical classes to solve the same problem, lack of quality assurance leads to poorly performing products and angry customers, etc. On the other hand, every process step you introduce comes with some sort of cost. It takes time to write a project report and time to read it. Somebody must probably be a central point of communication to ensure that individual programmers are aware of the types of problems that other programmers are working on, and verifying that something that “has always worked and we didn’t change” still works can be a big effort. So we have conflicting pressures: mistakes come with a cost, and process introduced to prevent those mistakes comes with some overhead. As a side note, not all process steps are equal in terms of power-to-weight ratio. A somewhat strained example could be of a manager who is worried about his staff taking too long lunch breaks. He might require them to leave him written notes about when they start and finish their lunch. The process step will give him some sort of clearer picture of how much time they spend, but it comes at a cost in time and resentment caused by writing documents perceived as useless and an impression of a lack of trust. An example of a good power-to-weight ratio could be the daily standup in Scrum, which is a great way of ensuring that team members are up to date with what others are doing without wasting large amounts of time on it. 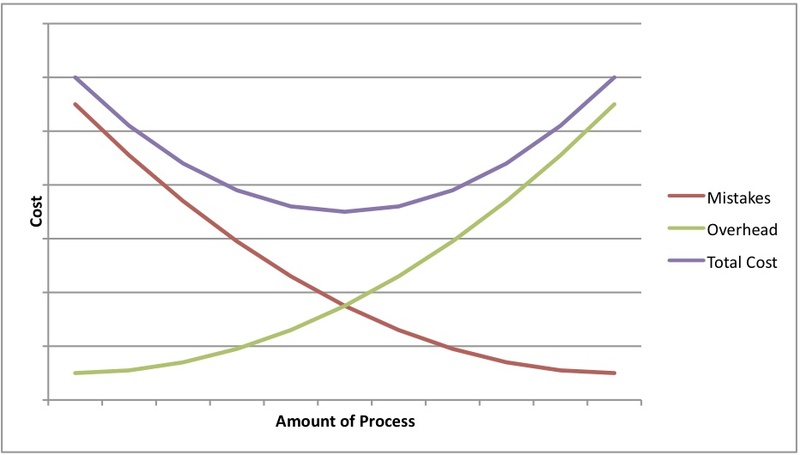 Getting back to the main point: when adopting or adapting work processes, we’ll want to find a sweet spot where we have enough process to ensure sufficient control over our mistakes, but where we don’t waste a lot of time doing things that don’t directly create value. Kurt Högnelid, who was my boss in 1998-1999, and who taught me most of what I know about managing people, pointed out something to me: at the sweet spot, you will make mistakes! This is counter-intuitive in some ways. During a retrospective, we tend to want to find out what went wrong and take action to prevent the same thing from happening again. But this diagram tells us that is sometimes wrong – if we have a situation where we never make mistakes, we’re in fact likely to be wasteful in that we’re probably overspending on prevention. Different mistakes are different. If the product at hand is a medical system, it is likely that we want to ensure that we never make mistakes that lead it to be broken in ways that might harm people. The same thing is true of most systems where bugs would lead to large financial loss. But I definitely think that there is a tendency to overspend on preventing simple work-related mistakes through for instance too much planning or documentation, where rare mistakes are likely to cost less than the continuous over-investment in process. It takes a bit of daring to accept that things will go wrong and to see that as an indication of having found the right balance. This entry was posted on June 9, 2010, 16:36 and is filed under Software Development. You can follow any responses to this entry through RSS 2.0. You can leave a response, or trackback from your own site.